Posted by Toy Lady in Cooking, Family, Food, random stuff. Seriously. When I was a kid, my mother made a tuna casserole that was . . . well, it was my sister’s FAVORITE dinner. I mean, while I was choosing tacos for MY birthday dinner, she was picking tuna casserole for HER birthday dinner. However, it was not my favorite. Not even a little. It was . . . noxious. It had canned tuna, crushed potato chips on top (remember, I’m from the Midwest – casseroles always have crushed . . . something on top!) and I really don’t know what else. Nor have I ever had any desire to know, unless it was to stay as far away from it as humanly possible. To be honest, I always felt a little, well, cheated about the birthday thing. I mean, every year, on my sister’s birthday, I had to CHOKE DOWN this . . . stuff. Plus, because it was her birthday, I had to be nice about it, too. But then, on my birthday, I always requested something the whole family could enjoy – lovely, tasty tacos. I would never inflict something so disgusting on others just for my own selfish gratification. But then, I’m just a giver, I guess. Then, when I got out out in the world a little, I discovered tuna noodle casserole. Tuna – yes. But no potato chips, and none of whatever else made the tuna casserole of yesteryear so gross. And simple! Just cook some noodles, drain a can of tuna, and open a can of cream-o-mushroom soup, and, well, Bob’s your uncle. Yeah, well, the novelty wore off pretty quickly. I mean, really, cream of mushroom soup? Then, a couple of weeks ago, I stumbled on a Food & Wine recipe for Linguine with Tuna and Other Stuff and decided to try it. So we did. We mostly followed the recipe, allowing for not having linguine in the house and a couple of things like that. 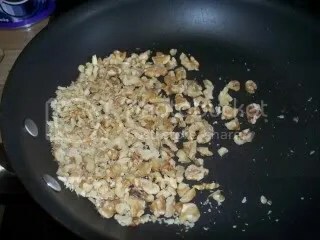 While the water was heating for the pasta, the first thing I did was toast some walnuts in a dry pan. I just sort of chopped them up a little with a knife – I didn’t want them ground, but I didn’t want them whole, either. I always get a little nervous toasting nuts. It’s so easy to go from toasting. . . almost there. . . just about browned . . . another second . . . CRAP. You know what I mean? So I stay right there, hovering and stirring and shaking the pan until I can just barely smell the roasty-toasty-nuttiness. So we set aside the toasted nuts and turn our attention to a lemon. Using a Microplane™, I zested an entire lemon, and that’s plenty of zest – a couple of teaspoons. Oh, and be sure to zest the lemon before squeezing it. It’s just easier that way. 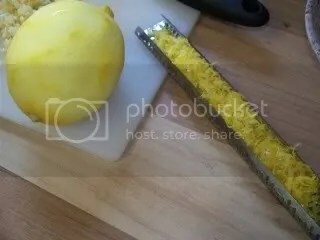 I only used the juice of half the lemon, so I wrapped the rest of the naked lemon and stuck it in the fridge to use next time we need lemon juice. 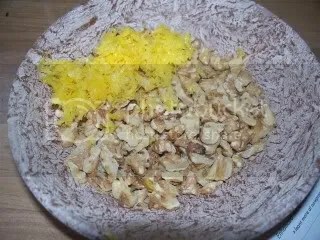 The lemon zest can just sit tight with the toasted walnuts. They get added at the same time anyway. 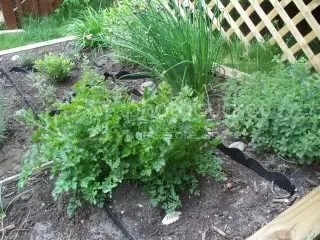 Then it’s time for herbs. Well, that does help. Some. So to the garden I go. Boy, this perennial stuff is great, huh? With ZERO effort on my part, the parsley, oregano, chives, garlic chives, and tarragon are all ready to take on the world! We just added thyme this year, as well as a little marjoram – both too small to really consider any kind of contribution at this point, sadly. And oregano and tarragon might be weird, and rosemary in any quantity would probably be a little overpowering. . . so I used a bunch of parsley, chives, garlic chives, and, to top it off, I chopped up a ramp from the fridge. Finally. We can get started! 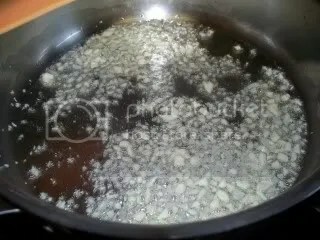 The water was probably boiling by this time, so we dropped the pasta – that needed to cook about 7 or 8 minutes, then get drained, so we’re in good shape there. I heated about 1/4 cup of olive oil (not the extra virgin – just the regular stuff we cook with) until it was shimmery, then sauteed 4 or 5 cloves of minced garlic, just until it was softened. Mmm. Garlic. We love garlic. While the garlic was cooking, I opened two cans of tuna – the kind packed in water. I don’t like the oil-packed tuna, and I don’t think I’ve ever bought it. But, you ask, if I’ve never bought it, how do I know I don’t like it? Well, my mother always used the tuna in oil when I was a kid, including in her infamous tuna-potato chip casserole. I don’t like that kind of tuna. However, since the original recipe doesn’t know about the tuna-casserole-from-hell and assumes I’m using the oil-packed stuff, I just drained the water off and added a little extra olive oil to the garlic. Easy fix. 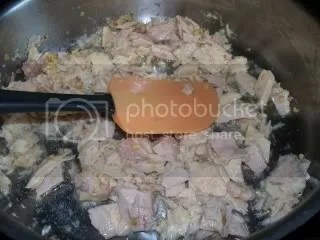 Simply stir the tuna into the same pan with the garlic that’s positively swimming in olive oil. 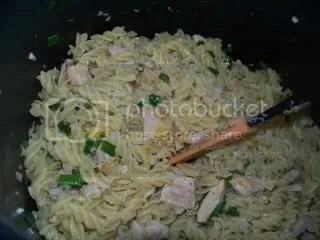 And once the pasta is done, and drained, and returned to its pan, we dump in the oiled tuna and garlic, along with the half cup of chopped herbs, the lemon zest, toasted walnuts, and some salt and pepper. Squeeze half the naked lemon on top, then stir everything together quickly. This is it, so we do want it to be at least somewhat hot, right? And there you go. It may be a little dry (I used a smidge less oil than originally intended) – if that happens, I’d just drizzle a little extra-virgin olive oil on top. I know it probably does make a huge difference, but I just can’t see using The Good Stuff to sauté garlic. I’m just saying – save it for the end, when you can really tell. And the verdict? We are so doing this again. It was delightful that night, it was good a little later when it was cold (is there a possibility for a pasta salad variation? ), and it was just fine reheated. While we would automatically reach for the Parm to go over something like this, we resisted, and I’m glad we did. Not that it wouldn’t be good – but it wasn’t necessary. 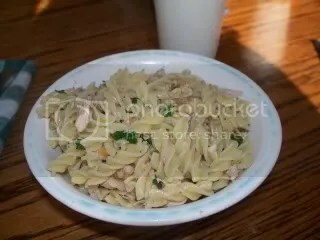 The plethora of fresh herbs, along with the crunchy, almost meaty bits of walnuts, have nearly redeemed “tuna casserole” for me. We don’t need no stinkin’ potato chips.